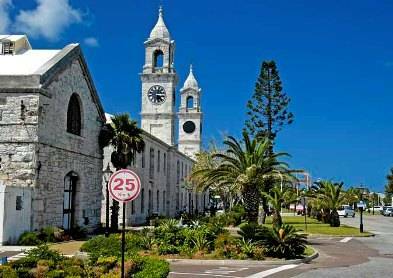 Located at the Royal Naval Dockyard, it's hard to miss this impressive building with its twin clock towers. The two towers on the two sides of the building are 100-foot high, one having a clock that shows the real time and the other with a clock that shows the time of the high tide. The Clocktower building was built in 1850s as a warehouse for the British Navy which once had an active operation at the dockyard. The walls of the building are some 3-foot thick. Today it's a major shopping mall at the western part of Bermuda. The upper floor of the ClockTower Mall is now home to the West End Development Corporation (WEDCO) and the Bermuda Corrections Department. There is a small area near the WEDCO entry way with some old pictures of the Dockyard, etc. But it's not a gallery – however access is not restricted per say to the public. It is more to make it attractive and interesting if visitors wander up the stairs. Clocktower mall has quite a few outlets of the major stores of the island that have their main branches in Hamilton City and elsewhere. In 1990, the Clocktower was opened as a shopping mall for the first time with some 10 stores in it. Now the mall with its lower and upper level galleries, have some 25 stores. The stores in the Clocktower Mall are open all seven days a week. Bus #7 and 8 operate between Hamilton City and Dockyard. The dockyard is also accessible by ferry from Hamilton (Blue Route) as well as St George (Orange route, operates in summer only). They have several branches and outlets including in Hamilton City. The store has accessories, gifts, souvenirs, as well as perfumes at duty-free prices. They also sell glassware items, handcrafted jewelry from local designers. But we love the miniature wooden models of island's famous buildings and monuments. Phone: 441/295-3961. This relatively news store is run by the Woodmore family and sells different flavors of fudges (some six to seven different varieties). All fudges are sold in pieces (weighing half or one pound) and homemade in the island. A boutique store stocking great collections of women's wears sourced from various countries of the world including Milan, Paris, London, New York etc. It also has one of the largest collections of swim wears. There is also a section for shoes. Other items include Italian ceramics etc. This is a branch of a family business since 1922. They are known for their high quality jewelry and watches. Prices here are generally cheaper than the U.S retail price. You will get elegant gift items that are not very expensive. The shop includes fine collection of Bermuda tea towels, bun warmers, tablecloths, place mats, plus many other accessories. They are in business of jewelry since 1954 and have large collections of Tanzanite, Mexican Fire Opals, Emeralds, Rubies, Sapphires, Diamonds, Topaz, and various other stones. They are also well known for Bermuda Lucky Stones and Destination Bangles. Husband & wife Boyd and Muna Vallis run this store. It offers nice souvenir and gift items like carved wooden animals, wind chimes, jewelry and trinkets that they bring in from Indonesia. The shop also sells various art & craft items, furniture, clothes and other accessories. The couple boasts of selling items at the right and affordable prices. Phone: (441) 799-5657. This is a boutique store selling men's and women's clothing at affordable prices. The stocks change every 2-3 weeks, so you will always find something new here. You get nice collections of fragrances and cosmetics. The shop is owned by Gibbons Company which has a large store at Reid Street in Hamilton City spreading across three floors. Sells fashion and accessories items. The shop is run by a well known local artist Carole Holding. She is also a renowned chef. This shop has gift and souvenir products that have paintings with floral and island themes, and are designed by Carole. It also offers authentic local food products. Check out the link for details. Store selling high-end designer sunglasses, bags and accessories from big brands like Dolce & Gabbana, Gucci, Giorgio Armani, Robert Cavalli etc. Phone: 441/735-5595. Sells a range of T-shirts and souvenir items. Here you will get Bermuda's locally made windbreakers. Some unique stuff includes island tea, spices and sauces. There is a range of health, beauty and toiletry products and other essentials like suntan lotion, snorkel & beach gears. You will also get cool drinks, snacks, locally made cookies and cakes, and chocolate bars. Phone: 441/234-3728. This studio shop is run by the local artist Christa Leduc who makes splendid jewelry items using sea glass, shells, Bermuda coins, gemstones etc. Items include pendants, bracelets, anklets, necklaces, earrings etc. Update 2014: The store is closed but she sells her jewelry online through her website. Great custom T-shirts. They'll make it in just 5 minutes. This stationery store has photo albums, pens, delicate pastel notepaper with pictures of Gombey dancers. They also have stationery that are themed on Bermuda. They have received Bermuda Gold Award for excellence in shopping and services. It also has a range of high-end gifts and stationery selected from sources around the world. Phone: 441/234-1698. 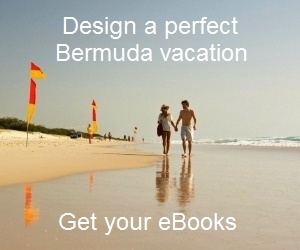 1) Check out Bermuda Shopping to know all about shopping and the best stores in Bermuda. I guess we all have bad days. Sorry for late response didn't see this post and no one pointed it out. Fair-trade Bermuda is a very busy shop. The customers do frequently steal and they do change the price tags on items. No, really? yes. We do have a sign at the cash stating this and we do have a notice that "prices will be confirmed at cash as customers change the prices". Not everyone reads the sign, including the ones that say "ice cream unwelcome", and "no photos". What to do? I remember Ron well. Was a very busy day, cruise ship must have been leaving. The price was incorrect on his purchase, i mentioned it to him and gave him option to buy or not. He bought. Its hard when people only have a short amount of time to solve their grievances. So many of our customers are repeat year after year and so many people leave smiling because they got a good price and had a good experience in our shop that is hard to say what went wrong with Ron. Its not politically correct but customers are not always right and people do have a habit of stealing and doing things they should not. We are sorry Ron had a bad experience. Come and see for yourselves. All are welcome. We've been in business 25 years, we serve thousands of customers a week, and we strive to create the best possible time in the short amount of time the customer spends in our shop. Hi I was there last summer and purchased a beautiful coral necklace at the Carole Holding shop. Vanessa The sales manager told me it was genuine Bermuda necklace but after two weeks I returned to the US the color has faded. I paid almost $200, don't buy, this store is a rip off. This is based on the reply from my manufacturer. The coral used in my necklaces is dyed natural white genuine coral. Many countries cannot sell coral. Most coral now sold is the natural white coral which is usually dyed. Normally the colour does not fade as long as it is kept from water, chemicals such as perfume, makeup etc. Red coral if sold usually costs thousands of dollars per gram. As mentioned this customer thinks her necklace was about $200.00. I am not sure I have sold any coral for that price perhaps she purchased other items at the same time. Again I am sorry the customer is unhappy. If she has got the necklace wet then this is the reason for loosing the colour. If she has sprayed perfume again the same problem occurs. I know I never spray perfume on myself anymore since most perfumes are now made from chemicals and not the old enfleurage method, even with silver/gold or pearl jewelry it is not good to spray... I do hope this explanation will help this lady. I assure you the necklace is definitely not fake as she has suggested. My wife and I visited the clock tower mall last week in particular Fair Trade Bermuda and found the owner Boyd rude and obnoxious. He changed his own sticker price when we got to the register and refused to give us the item at his sticker price. I feel this is extremely bad management on his part because of a dollar I will tell and warn everyone I know not to buy from him. I have already posted on Facebook and will use every known social media to get out the word to stay away. Hi! I was on the Norwegian Dawn's last voyage there this fall. This was my first trip to Bermuda, and we had a wonderful time! I am trying to find the name of a shop in the clocktower mall where I purchased several items. One of the items was a round silver charm for my pandora bracelet filled with pink sand. The sand fell out very soon after I returned home and I am terribly disappointed. I was hoping to contact the seller, but cannot remember the name of the store (of course I paid cash). It was a beautiful store that sold place mats and kitchen items as well as beautiful lamps and comforters. They also glass items, and polo type shirts. The jewelry was at the counter. Hopefully you know which shop I am referring to and can tell me a name so i can contact them. Thank you!!!! Hi, From your description it appears that the store is The Grand Bazaar. Their website is www.grandbazaarbda.com, Email is: [email protected], and their phone number is: 441/234-4646. Hope this helps! Hi, The Perfume Shop at the Clocktower Mall in dockyard is owned by the Gibbons Company.